To celebrate, I will have projects made with Unity stamps all week long and then on Sunday I will draw a name from all of the week's comments (Mon-Sun). That person will win Unity stamps! Who doesn't like Unity stamps? I have 4 of the Unity monthly kits so far and LOVE them. 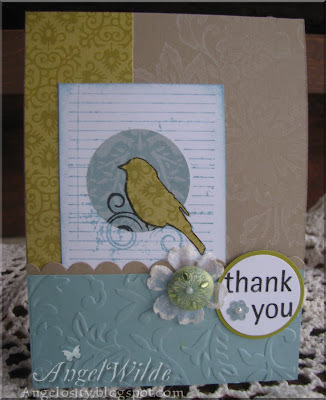 My project today uses the bird image from February's kit and the thank you sentiment from January's kit. 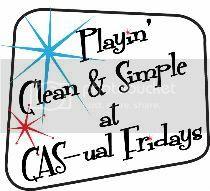 I masked the sentiment to take it from one line to two to fit my circle embellishment. I love how this card turned out! I sure hope you aren't getting tired of these "Woodhaven" papers because I have one more project to show you! Unity is giving one of the following free kits to one of my followers: Margarita Moments, Along for the Ride, Berry Good Life or Grow Yourself Extraordinary. 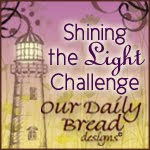 You can subscribe or follow my blog by clicking the link on the right sidebar. Great design and love the paper piecing. Just beautiful! Thanks for sharing! You make lovely cards...And I agree Unity stamps are wonderful. Have a nice day and a lot of fun on the unity blog..I follow you coming monday. Love the texture Angel! and right? who doesn't LOVE Unity?! not possible! So pretty. Love the colors and the bird! Glad I found your blog. Thanks Unity! Oh bird!!!! I soooo love birds....soooo many stamps...none as nice as the unity ones though! lol! thanks for sharing another wonderful card. Love this colour scheme too! Soft and spring-like! Oh how I love birdie cards!!! Love birds and Unity Stamps. They are good quality stamps so I enjoy stamping with them. Very pretty! Love that bird stamp and also love the soft white stamping on the kraft background! Cute card! I love those spring colors! Such a sweet bird! already wrote in so many important things in there,love it,it's beautiful! Pretty card! Love the sweet bird. Congratulations on being the Growing in Unity Stamper, Angel!! I love your beautiful card! !